Chicken fillet is a good source of low-fat protein, B vitamins and selenium, an important antioxidant that is lacking in many Western diets. Yogurt supplies calcium for bone strength and the salad provides a range of vitamins. Cut each chicken breast into 4-5 slices. Measure 100g of the yogurt into a bowl. Season and add a little of the cumin. Add the chicken, coat well, cover and marinate for 1-2 hours if possible. Heat a grill or griddle pan to medium-high and grill the chicken, turning halfway through, for about 8 minutes, or until cooked through and golden. Leave to cool a little. Meanwhile, mix the remaining yogurt and cumin, the lemon juice, garlic and honey, and season. Halve and split the pittas and fill with some of the salad leaves and cucumber. 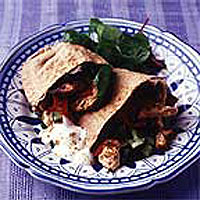 Divide the chicken between the pittas, spoon the dressing over, and garnish with the pepper and coriander. Serve with any spare salad on the side. Breakfast: Luxury muesli with skimmed milk and blueberries. Lunch: Winter vegetable soup (either homemade or ready-prepared). This recipe was first published in Thu Jan 01 00:00:00 GMT 2004.